Adam's facial expression for pretty much the whole trip. The trip was supposed to be pretty mellow: climbing and Luna's inaugural backpacking trip. We figured we'd do something simple, a easy overnighter, and that we'd ask the rangers what they recommended when we got a backcountry permit. When we arrived, we spent the first day seeing the sights in the Valley. It was fun, but the girls were knackered after the drive. I was really focused on the climbing. We were there too early in the season to do the climb I really wanted to do, so we did some single pitch stuff around with the kids, and then Adam and I tried to find a decent moderate multi pitch. The climbing was awesome. There was really only one downside: the kids. Climbing with babies is one thing we've yet to master. We'll have to plan another trip sans babies to go climbing here... Or just come back when they're older. 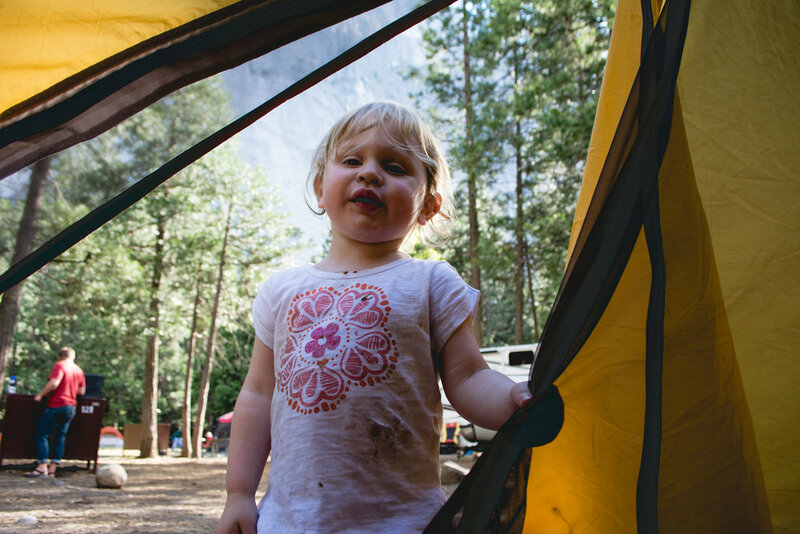 We booked two nights in the Valley and then planned to stay a third in the backcountry, doing our first backpacking--or, as we like to call it, "kidpacking"--trip with Luna. I was so preoccupied with climbing that I didn't really pay much attention planning the backpacking trip. I quickly went into the Ranger station where you get the permits and asked what we should do. One kind Ranger recommended a 20 mile hike; we'd hike in 7 miles the first day and out 13 the following day. His proposed route would take us along the Southern Rim of Yosemite Valley, from "Tunnel View" to "Illilouette Falls" and then back into the Valley. The ranger suggested we camp in between Inspiration Point and Dewey Point, because there was still snow pack in a lot of places. He marked an X on the map at what he thought was 7 miles in. We could park the truck at the Tunnel View parking lot, and we could stay in the backpacker's camp in the valley the night we returned. Then, the following morning, we'd head out to meet up with the rest of the family in Martinez. It all sounded great! We got two bear canisters. We figured one could house lunch/dinner for the first day and then hold the dirty diapers overnight, and the other could hold the rest of the smell-ables that we didn't want to store with the bescumbered diapers. Extra weight, but we thought it'd be worth not having day 2's food next to kid poo. Map, canisters, and with high hopes I headed back to meet up with the crew to gear up and get to the trailhead. When you have kids, you have to plan extra time for little dalliances. First it is a diaper change, then it is a snack, the next thing you know it is lunch time... and we're still not on the trail! I thought, "How did I let it get so late! I planned extra kid time!" Having two kids doubles the amount of time you need to get ready. That, and, well... This was our first trip out with two kids. We got to the Tunnel View overlook mid afternoon. Tourists buzzed about, taking pictures of El Capitan across the way. We took a few obligatory selfies (that didn't turn out) before getting started. We packed what was in the back of the truck in the cab, loaded up our backpacks, and got on the trail. We figured the late start wouldn't be so bad. We were wrong. At first we felt like we were making good time. But then the sun started to set, and we took longer getting up to Inspiration Point than we would have liked, so after our second stream crossing in the dark, we decided to just make camp a little ways off the trail. We quickly made camp so we could make dinner. What we do on overnighters, since weight isn't as much of an issue (but with the kids increasing in weight, we're considering becoming gram-misers), we eat Indian food. We food water on to boil, and put in our favorite microwaveable Indian sauce packets to warm. By the time the water boils, the packets are piping, we remove them from the water. We cook instant rice in a gallon Ziploc bag with the boiling water. Annndd, that is about as gourmet as you can get in the backcountry. While Adam and I filtered water, Ashley got the girls ready for bed. It was a bit chillier than forecasted, so we wrapped Luna (who was only 3 months, at the time) in my puffer: instant sleeping bag! For Sophie, from about age 1 on we used a snowsuit (like this) in lieu of a sleeping bag (that's what she is in under the purple blanket above). The kids always sleep really well... Haha, well. No. 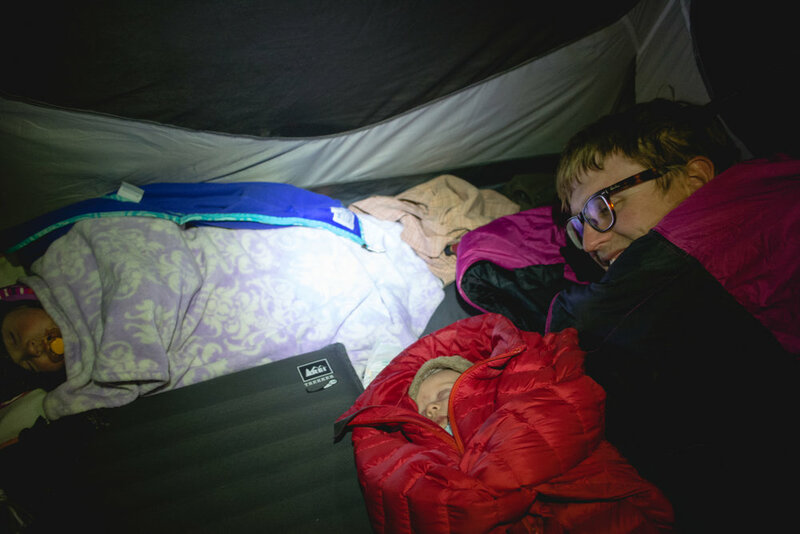 (For an example of a hellish night with a baby, read about our Coyote Gulch trip with Sophie.) But, they did this night. We have a love-hate relationship with setting up camp in the dark. On the one hand, it is somewhat dangerous, and sucky because doing everything by headlamp is harder. Plus, if we’re setting up in the dark, it usually means that something else went wrong. On the other hand, we love waking up in a completely new place. This morning was one of those mornings. The creek we thought was about 100 yards away, bends and was only about 25 feet away (behind Adam’s tent). There was snowpack just to the left of our tent we didn’t realize was there. And the morning light filtering through the trees made everything magical. We decided to try carrying Luna in a Moby wrap for this trip. It fit the smoothest underneath backpack straps, and provided the most amount of support for her neck (important for tackling obstacles on the path). The plan was to trade off occasionally, but Ashley ended up taking the backpack for the majority of the trip and I took both the girls. Sophie in the Poco was technically lighter than the backpack with the kit. However, Sophie moves and the sporadic shifting of weight makes the pack seem dramatically heavier than it actually is. The added girth on Luna in the front takes some getting used to (especially if you’re the type of hiker that looks at every foot placement… Not saying I am… Just that I can see how that would be a problem…) We usually walk with trekking poles, but I would say hiking/kidpacking necessitates trekking poles. We love the REI Power Lock poles. The power locking feature can be fixed easily in the field with a multitool or pocket knife, whereas the twist lock variety are not as easily serviceable (if at all). The cork handles are nice too. If you’re in Europe, and don’t mind that they’re not collapsible, we definitely recommend you check out Fimboo. I haven’t gotten a set yet, but I’m really excited about them. We made really good time to Dewey Point. In between Dewey and Taft Points there was a lot of snow on the ground still, and Sophie had fun eating snow and we enjoyed filling our hats with the snow to cool off. As I mentioned, we somehow lost a bunch of these pictures. Once we find them, we’ll do an update post. At that point, Ashley had to trade Adam from his pack (which was considerably lighter, since it didn’t have clothing for four, or any of the food). We trekked on. This is us shortly before Glacier Point. We look a lot better than we feel. As we approached Glacier Point, we were pretty knackered, and daylight was quickly fading. The sunset as we reached Glacier Point, which was absolutely beautiful, but terribly disheartening. As we walked up to the lookout, we discussed if we should continue on the Panorama Trail, or cut down the Glacier Point trail directly down into the valley. Adam’s knees were pretty worn out, and he was of the opinion that a few extra miles would be easier than really steep switchbacks. (We’ve never been down the Glacier Point Trail, but we’ve heard it is gnarly.) So, we took a short break as the sun totally ducked behind the trees on top of Glacier Point, and then set off towards the backpackers’ camp via Illiloutte Falls. By the time we made it to the falls it was pitch black and we were just trying to plow through. In hindsight, we probably should have just found somewhere to pitch up for the night and started again fresh in the morning. But, this was a type II fun trip—remember? Luckily, the kiddos fell asleep when it got dark, at least for our little freak out along the Panorama Cliff. So at least we didn’t have to deal with any problems on that front. By the time we reached the junction with the John Muir Trail, we were delirious, but pushed forward, emboldened by the fact that we finally had turned and were at least facing the Valley again (the crappy map we had was drawn in such broad strokes that we really had no idea what to expect on the trail, just vaguely where to turn. At Clark Point, somehow, we missed the turn to continue along the John Muir Trail and instead followed the trail that led us to the Mist Trail. Somewhere after Clark Point, but before the Mist Trail proper, we took a lengthy break, changed diapers, and ate some more food. It was 01:00. The pedometer read 28 miles. But at least the kids were still asleep. The next portion took us long time, and by the time we reached the staircase section of the Mist Trail it was 02:30. It wasn’t difficult hiking, but when you’re exhausted, have precious cargo, and it is dark, every step counts. When we got to the staircase, my adrenaline spiked. Ashley cried (to be fair, I think Adam did too). Sophie woke up, and started to sing, “Waterfall night hiking!” over and over and over. There are some moments cameras can’t capture. Waterfall night hiking was one of those moments. It was 03:30 by the time we reached the backpackers camp. Pedometer read 34 miles. By 04:00 by the time we had Ashley and the girls settled. Adam and I, free of our packs and still on an adrenaline high from the Mist Trail, hit a 20th wind and set off to pick up the truck. The beginnings of dawn made the type II-ness of the adventure really sink in. We didn’t make it a mile (it was something like seven miles back along the road to the truck) before someone stopped and picked us up. He was out trying to photograph the Horsetail Fall. Apparently the conditions were just right for the renowned ‘firefall’. He gave us a lift to the truck. Totally knackered, we made it back Ashley and the girls around 06:00, having been awake and hiking for almost 24 hours. We passed out, catching a couple hours sleep before driving on the rest of the way to Martinez. Do you have any Type II Fun kidpacking stories? Let us know—we’d love to hear them.